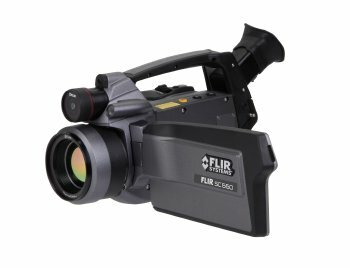 The FLIR™ SC660 thermal imaging camera offers superior thermal and visual image quality, spot size resolution and temperature measurement accuracy. It is ideal for all types of engineering, laboratory or field application that may benefit from thermal analysis. The SC660 infrared camera is a science-grade infrared camera with a host of advanced features. The SC660's high definition 640 x 480 pixel infrared detector delivers exceptional sensitivity, resolution and the image quality allowing it to measure even the most demanding applications. Proprietary FLIR Dynamic Detail Enhancement (DDE) technology further improves sharpness of thermal images. The SC660 also includes an integrated 3.2 megapixel digital video camera to aid in data presentation. Infrared and visual images can be stores in standard jpeg formats. A 5.6-inch widescreen LCD allows easy on-camera viewing of images. Using a FireWire interface the SC660 can transfer 14-bit radiometric data directly onto high capacity SD-cards or a PC for real-time analysis of captured images. The user can save a full 60 seconds of digital voice and embed it with each IR image allowing a full description of the target and measurement conditions to be recorded. In addition, data from the in-built GPS system can be used to exactly denote the camera's location at the time of making a reading. Drawing upon its long experience in thermal imaging - FLIR has included in the SC660 an abundance of features that enhance its ease of use, productivity and safety of operation. The SC660's ergonomic magnesium housing is designed for rugged portability and meets the IP54 standard, thereby protecting internal parts from shock, vibration, dust and water splash. The SC660 can run up to 3 hours on a single fully charged battery. Included with the SC660 is ThermaCAM® Researcher™ - a powerful Windows-based infrared software package that provides detailed precision analysis and measurement tools for capturing, recording, and studying extremely high-speed thermal events. For further information please visit www.flir.com/cs/emea/en/view/?id=41413 or contact FLIR Advanced Thermal Solutions on telephone +33 1 6037 0100 or email [email protected].